The Office of the Provost and Academic Vice President is responsible for RMC's academic mission, including administrative leadership, teaching, and service. The Provost and AVP's office is responsible for a wide range of initiatives, and provides leadership in the development and supervision of the College's academic programs and curriculum. The Provost and AVP's office also serves to provide services related to academic policies and procedures, faculty development, the curriculum, institutional effectiveness, research, planning, student learning, and various other areas of strategic importance. Dr. Germic came to Rocky in 2007 from the American University in Dubai, where he was head of the division of liberal studies. 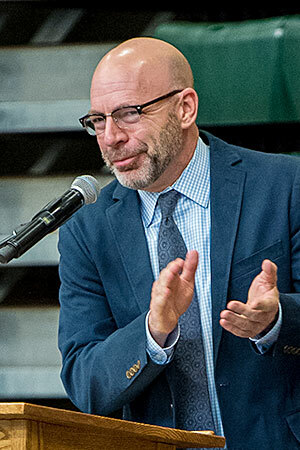 After completing his graduate work at Wayne State University, Dr. Germic began his career at Michigan State University as a member of the faculty of the Department of American Thought and Language. He then took a position with James Madison University before heading overseas to teach and perform administrative duties at the American University in Cairo. Dr. Germic has won teaching excellence awards at Wayne State University and here at Rocky Mountain College. A widely published scholar of nineteenth-century American literary and material culture, Dr. Germic is also the author of poetry and creative nonfiction. He is currently completing a poetry manuscript entitled Again, This Fable. His principal hobbies include trying to achieve marginal competence on the guitar and trying to keep his sailboat right side up. The Office of the Provost and Academic Vice President supports RMC's mission by coordinating and collaborating with various departments within the College. This includes promoting a culture of learning, teaching, and research across the campus. The Office of the Provost and AVP also ensures that RMC has the resources needed to support its academic mission. At RMC, diversity is more than a buzzword. Our enduring commitment to diversity of thought, experience, and people makes us stronger. We are committed to ensuring inclusion, equity, access, and opportunity. During 2015-2016, students traveling from 41 states and 16 countries selected from 52 undergraduate majors, 37 undergraduate minors, 3 graduate programs, and 11 pre-professional programs. RMC's vision is to provide an excellent academic and co-curricular experience to students at the undergraduate and graduate levels. RMC's focus is to become a cornerstone of education and healthcare, becoming the connecting threads between business, healthcare, and countless other professions.